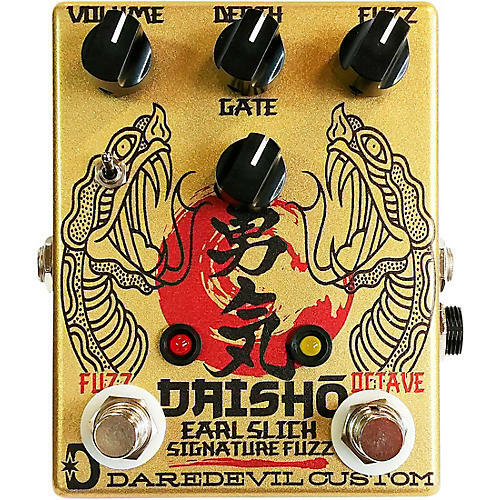 The Daredevil Daisho is the result of a collaboration with legendary guitarist Earl Slick. Designed for maximum dynamic fuzz and octave control, this 2-in-1 features independent circuits with an optional noise gate control to keep things tight in between playing. This original design Fuzz keeps the controls simple: Volume and Gain control, with a depth tone stack to boost or attenuate the low end. Counter-clockwise is vintage and bright with enough texture to cut through. Turn the depth knob to the right and listen to the bottom fatten up, bringing your tone right back to modern fuzz power. The Octave above circuit is stacked before the fuzz, giving you the most the effect has to offer. Double stops turn into swirling, gnashing sonic feq-out. High-end harmonic tones that stir up Hendrix-like sustain and singing sweet bite. This is an independent channel; stack it with your other favorite effects or use the Fuzz side on its own. The options are limitless. Noise gate control can be increased by turning clockwise, cutting out the background hiss in between playing, which can be helpful at high-gain settings with the Octave engaged. Bypass the noise gate when using the gain or volume rolled back to keep all the subtleties intact. This circuit has spent over a year as the main effect on Slick’s board, including the Experience Bowie tour. Hit it with a tele (his main axe) or humbuckers, P90s, etc. ; they all dial in great with this double-edged sword, which is what the Daisho name translates to. Kanji artwork is taken from Earl’s tattoo and developed by local legend and artist Casey Von Sass. True Bypass, runs on 9V neg ground external DC source.